Have these insects been identified? I’d like to know more about them besides their proximity to headstones in a cemetery. Are they fighting? Mating? What are these two up to? I’m not sure what they’re doing, but they’re fire bugs (Pyrrhocoris apterus), a true bug (Hemiptera) and a common species in Europe. We wrestled a bit with the question of whether to supply Latin names for every species depicted in this issue, but ultimately decided it was up to the contributor how specific he or she wanted to be. And obviously a few of the insects described in this issue are largely mythological anyway, so a consistent policy wouldn’t have made sense (does consistency ever make sense?). i did not know what they were called before submitting the photo to qarrtsiluni, dave found out. 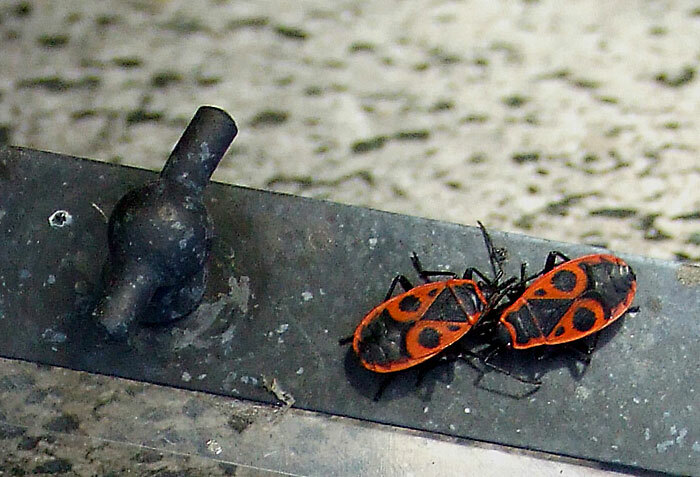 i call them “death bugs”, because the context i know them from is vienna’s central cemetery. they are everywhere. i don’t think these two were mating. not fighting either, as far as i could see. there were a lot more around them, and they all seemed busy, moving around a lot … maybe looking for something to eat. Thanks for the clarification on these bugs. They are beautiful.